Q: Sam, I run a Baseball Academy during the winter for all ages, but the bulk of my previous experience was high school. Do you have any favorite fielding and hitting drills you’ve found to be most effective with young players? Thanks, Phil. A: Phil, thanks for your question about fielding. Just so happens that falls into the category of my favorite drills for infielders of nearly all ages. My biggest belief with infielders is to CATCH the ball first, then THROW it second. I preface everything by saying we must catch all the balls hit that most people call “routine.” In my teaching though, I don’t allow the word “routine” to be said! As soon as we call the ground ball “routine,” the more we relax, and the more easy mistakes we make. Quite frankly, there are no routine plays in baseball, some are just a little more difficult. So I know you are probably asking what do you call them? I call them the ball you get 80% of the time, not the ones way left or right, but simply the balls in the area we get 80% of the time!! Having said that, we now work on catching 100% of the 80%-ers. If you do that the other 20% will take care of themselves. So, now that we know we want to catch all the balls at you, how do we do that? Let’s go back to catch the ball first and throw it second. I believe in no excess motion with the glove promotes good habits and prevents easy mistakes. I like to start with the glove out in front and low. I like it out there early. Pretend there is a giant eyeball in the center of the pocket, and that eyeball tracks the ball on the ground. Glove closed, eyeball can’t see. I think you get where I’m going. Then I pull infielders up on the infield grass, make them start with the glove down, pocket open, and then I hit them a grounder. They are not allowed to do anything but catch the ball. No other movements allowed. Just catch it and hold it there for a few seconds. Then continue to hit more and do the same thing. You will see this keeps the glove quiet, and the infielders will get the idea that we are slowing the game down, thus making it easier to make all the 80%-ers!!! It may take a few times to get the hang of it, but Phil, I promise it will work. And that’s from big leaguers to little leaguers. I know this will help. Good Luck. A: Ken, fear of the ball is not always an easy task. If your son really likes baseball, then you have a good chance to fix him. What I would do if I worked with him would be to get some soft balls to throw to him so he isn’t afraid if he gets hit. Maybe even throw a few at him and after he realizes it didn’t hurt, you’ll be one step closer to achieving your goal. As I said, you’ll need some patience. Q: Sam, with this being Derek Jeter‘s final season, do you have any memories of him that stand out from your days coaching against him? Thanks, Tony. Thanks again for the great questions. I always enjoy the interaction with you. 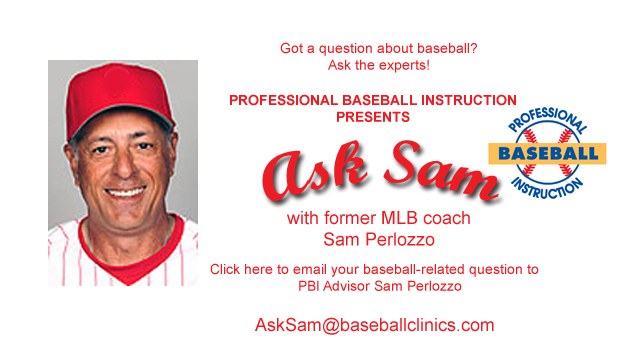 Send your questions to me via email at AskSam@baseballclinics.com.